Please Sir, Can I Have Some More, Congee? One of my favorite things to do on a cold winter’s day is go to Chinatown for a big bowl of rice porridge. In New York City, we have several amazing places to get it. Since it’s not really popular among non-Chinese visitors to Chinatown, you don’t see it on most menus, so you have to go to the smaller, “more-Chinese” restaurants. Often you’ll see the character of it hanging or flashing in the window. A truly pan-Asian dish, the word Congee is not Chinese but comes from south India. 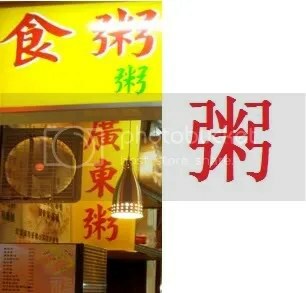 The Cantonese call it JOK and Mandarin speakers call it either JYOU or SHE FAN. Congee couldn’t be any simpler. It’s just boiled rice that stays soupy. When it boils for hours, it gets very creamy and the rice kernels almost disappear. Depending on where the owner of the restaurant comes from, your bowl of Congee will vary slightly. Simple Congee can be served with just slivered ginger and chopped scallions. And then, getting a tad more complicated, some add pork or beef with cilantro. One of my favorites is Congee with PI DAN, which is preserved egg also known as Thousand Year Old Egg. To a western eye, the egg looks, well frankly gross, but try it because you’ll be surprised how delicious it is. In Taiwan, you will find it served with sweet potato, and in Japan, they add various types of pickles or even dried fish. 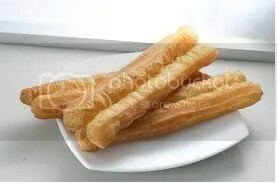 Another very popular addition to Congee is YO TIAO or fried dough sticks. Usually, they are cut into smaller, bite-sized pieces and garnish the top of your rice porridge. I make Congee often at home during the colder months and sometimes, just with fried egg along with some scallions sprinkled in. As do some Chinese, I also like to add some vinegar and/or sesame oil as well. And if I’m feeling spicy, a big heaping spoonful of chili sauce can also give it a nice kick. Previous PostThe Garbanzos – Circus Family or Bean?